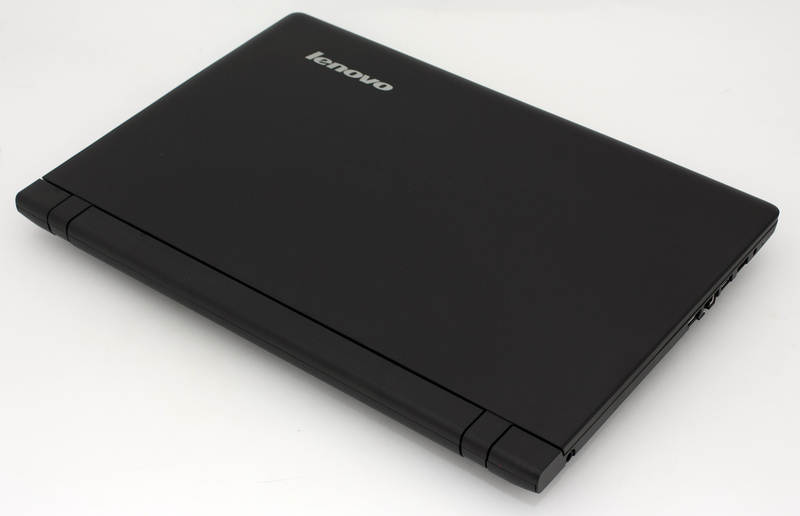 Another budget-friendly notebook has landed in our lab and while the Lenovo Ideapad 100 doesn’t offer an impressive hardware, the notebook does feature an outstanding design and build quality. Well, the design part is more of a subjective opinion but the build quality really is impressive. It’s important to note that Lenovo has released two notebooks that belong to the series, but they differentiate from each other in screen size and battery capacity. The one with us has a 15-inch screen diagonal and a 24Wh battery capacity while the 14-inch variant integrates a significantly bigger 37Wh battery. This will surely impact battery life and we are quite puzzled why Lenovo has cut down on battery capacity for the larger model. Usually, bigger screen means more power drained and, of course, bigger body that can hold a larger battery. Also, Lenovo is shipping its units with 1333MHz DDR3 RAM at least according to their site, but the unit we are testing here features a 4GB 1600MHz DDR3 RAM in one chip. Maybe this is one of the ways Lenovo has kept the costs so low for the Ideapad 100. 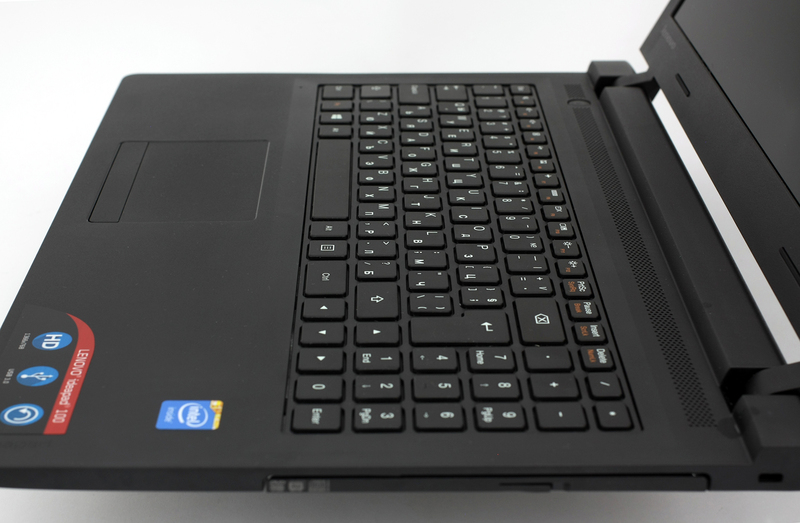 Nonetheless, there are other variants of the notebook that come with quad-core Pentium N3540 CPU or a higher tier Celeron N2940 chip for better performance. 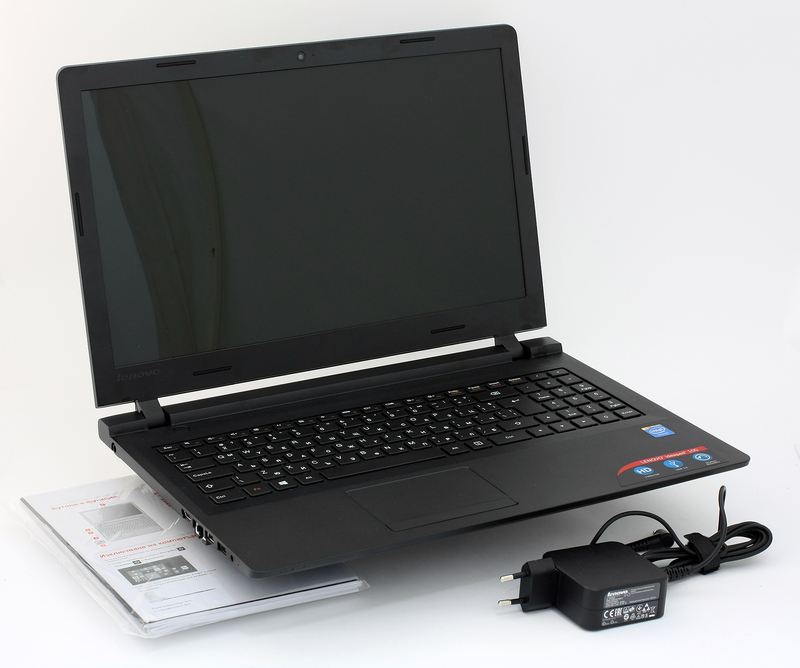 The packaging of this laptop is very simple – the notebook itself, a bunch of user manuals and the AC charger. As we already mentioned, the notebook boasts a relatively attractive design, at least for a €200 notebook. But the most interesting part here is that the chassis of the machine feels quite sturdy and solid. You have to apply really big pressure on the lid to see any bending at all and almost no ripples can be detected on the LCD screen on the other side of the lid. The keyboard doesn’t sink as well, but most importantly there are no irregularities like holes, cracks or screeching around the edges. We do think, however, that the bezels around the screen are too easy to bend. Nothing too serious, though. Let’s start with the back side of the lid. It has a hard plastic cover with interesting texture, but it’s prone to leave nasty smudges and fingerprints. Going around the lid you will see the 15.6-inch screen with glossy finish and the built-in webcam on top. Hinges feel a bit overtightened because you will need both hands to open the notebook. We find this a bit unnecessary as the notebook doesn’t have a touchscreen and no wobbling effect occurs. As for the bottom piece, it doesn’t offer anything out of the ordinary, but you can at least pair the machine with an external cooling pad due to the provided vents. 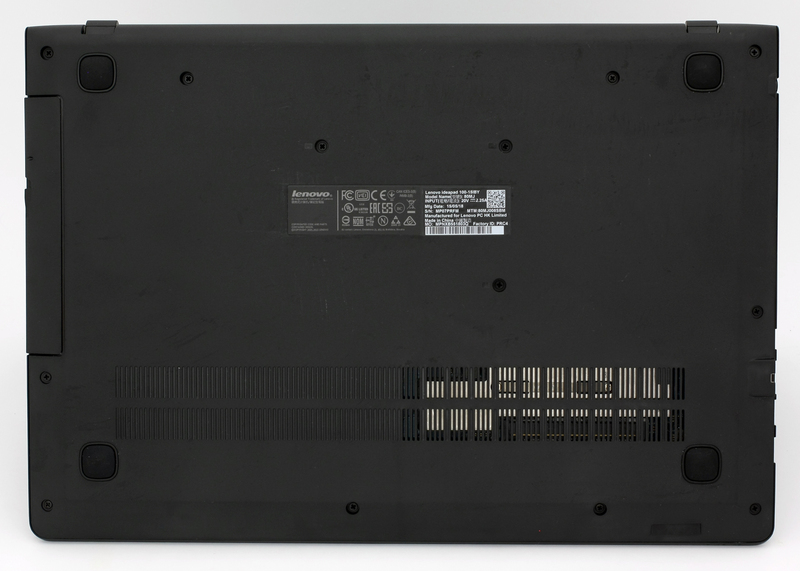 The edges around the chassis are flat and are only 22.6 mm thick making the notebook extraordinary thin for this class. Maybe this is because the notebook doesn’t need any additional cooling and no fans are placed. 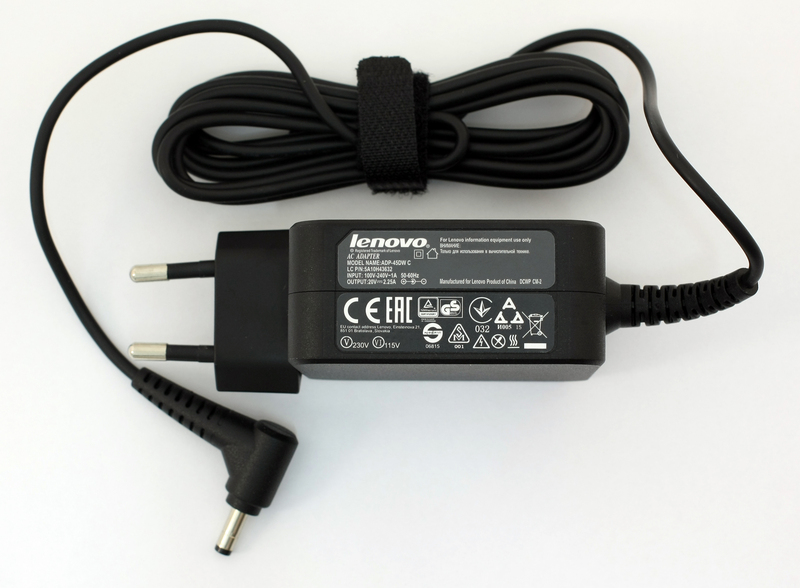 The left side contains the DC charging port, HDMI, RJ-45, 3.5 mm audio jack and two USB ports with one of them being 3.0. Going around the right side you will see only an optical drive. Opening the lid reveals the rest of the notebook – the interior. It’s made of the same hard plastic used for the rest of the notebook but doesn’t have the texture feeling the lid has. Again smudges and fingerprints are easily attracted. The keyboard feels okay without that “sinking” effect, but keys appear to be a bit stiff with not enough key travel. Also, the small enter key is smaller than it should be due to some design limitations. Come to think of it, the arrow keys could have been a bit smaller so the Numpad area would benefit from bigger buttons. Furthermore, the touchpad as simple as it is we liked it. It doesn’t follow the conventional style with one piece but rather uses a touchpad area with dedicated mouse buttons at the bottom. 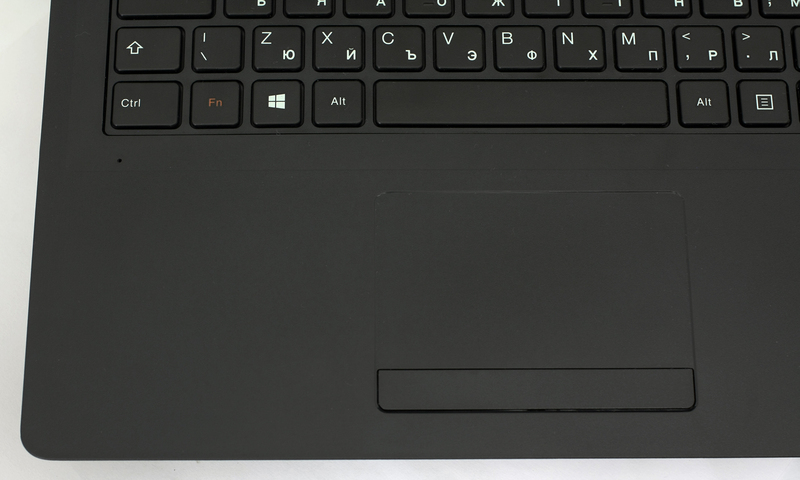 This way the budget-friendly notebook benefits from a stable touchpad rather than integrating a wobbling piece that gets in the way. All in all we really liked the design and construction of the Ideapad 100 – it’s sturdy, simple, clean, it has a thin profile, and relatively light chassis (2.31 kg). That’s more than you could ask for an entry-level notebook. Ideapad 100 features a 15.6-inch display with TN panel manufactured by LG with a model number LP156WHB-TPC1. The resolution is 1366 x 768 (HD) and the aspect ratio, of course, is 16:9 leading to a 100 ppi (pixels per inch) and pixel pitch of 0.253 x 0.253. The screen can be considered as “Retina” when viewed from a distance equal or greater than 86 cm. 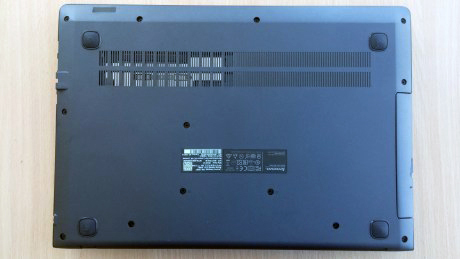 Lenovo Ideapad’s display offers poor viewing angles as a result from the TN panel used inside. Here’s how the image quality changes when viewed from a 45-degree angle. The maximum brightness measured on the surface of the screen is 226 cd/m2 with a deviation of only 4%. The average color temperature on the surface of the screen equals to 7300K – a bit colder than the optimal one of 6500K(D65). No unacceptable deviations here. 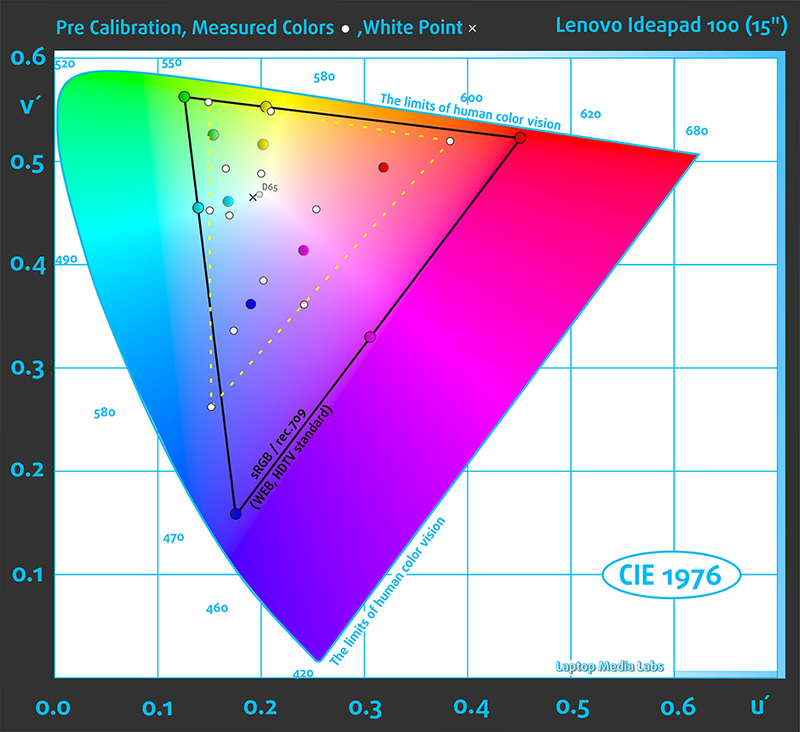 The yellow triangle indicates that the Lenovo Ideapad 100’s display covers only 54% of the sRGB and 47% of the Adobe RGB color gamuts. A significant portion of the colors will be missing that will lead to colors appearing too pale. The image below is practically the same but with the recorded results – the one on the left before calibration and the one on the right after. Color circles represent the reference colors and white circles being the result. You can see main and additional colors with 100% and 50% saturation inside the sRGB gamut. We calibrated the display at 140 cd/m2 and target color temperature of 6500K. We used X-Rite i1Display Pro calibrator and conducted the tests with the new profile and before profiling. 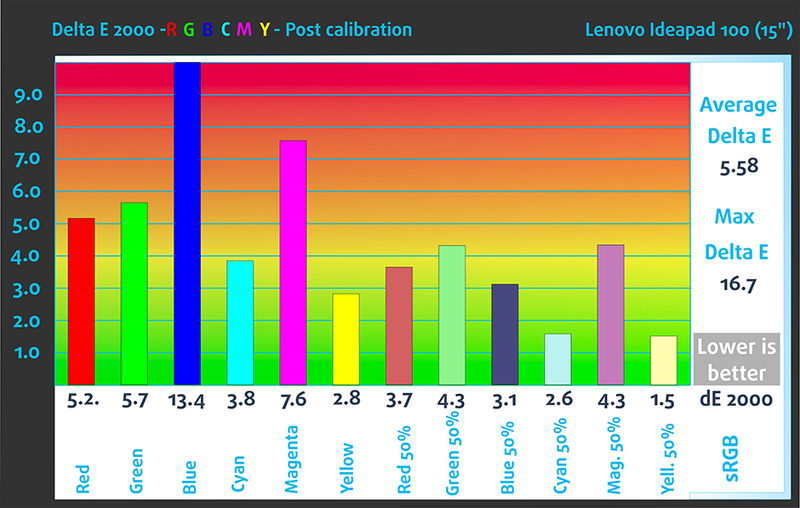 With the help of 24 commonly used colors, we checked the color accuracy of the panel. Colors that we used represent skin tone, grass, blue sky, orange and etc. 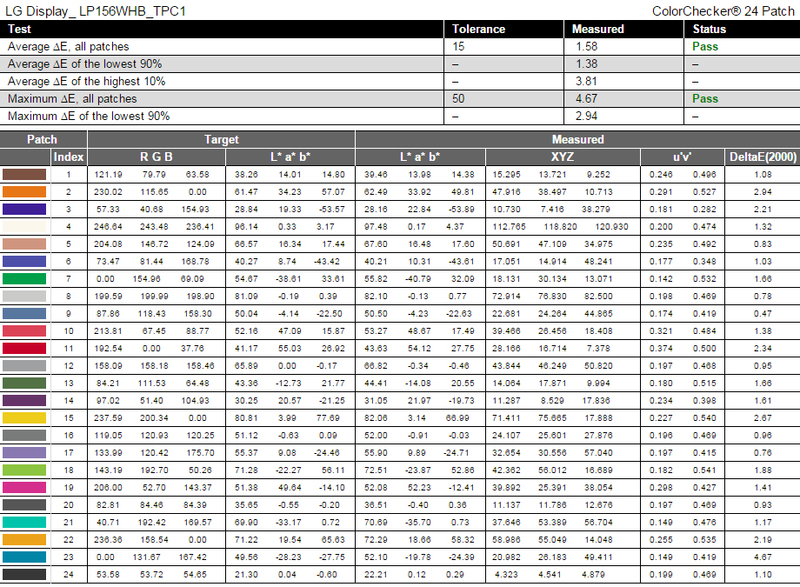 The average DeltaE 2000 is 1.58 after calibration. Lower score is desirable and deviations under 1.0 can be detected only with a lab equipment. The measured contrast ratio was 350:1 before and 280:1 after calibration. Ideapad 100’s display uses PWM across all brightness levels except for 100%. However, the frequency of the emitted light is 22 kHz making the display a bit more acceptable and only users with really sensitive eyes will feel the difference. We recorded the refresh time of the pixels from black to white and white to black for 10 to 90%. So we were able to measure Fall Time + Rise Time = 15 ms. As usual, TN panels have faster response time making it more suitable for fast-paced games. 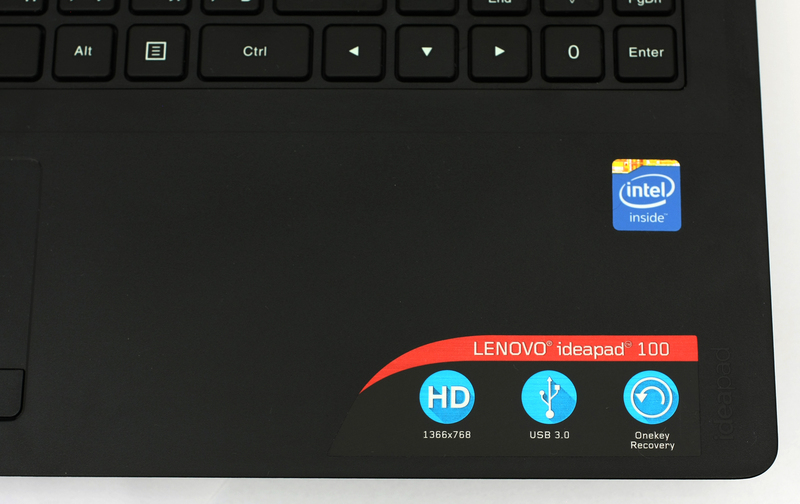 The panel used here in the Ideapad 100 is an entry-level hardware that has to offer energy-efficiency, accurate colors after calibration and relatively high frequency of the emitted light making it suitable for most users without affecting their vision. Nonetheless, the TN panel carries a set of drawbacks like low sRGB color gamut coverage, low contrast ratio, low resolution and poor viewing angles. We are presented with a relatively good sound quality at low and high sound frequencies. Though, speakers could have been a bit louder. We aren’t expecting good readings on our battery tests due to the small battery used for this model – 3-cell rated only at 24Wh. However, the 7.5W CPU and HD TN panel will most likely affect battery life in a good way. We’ve run our usual tests like web browsing, video playback, and gaming. All tests share the same conditions – Wi-Fi turned on, power saver on and screen brightness set to 120 cd/m2. Despite the Ideapad 100 being a budget notebook, we are somehow disappointed with the results – 230 minutes (3 hours and 50 minutes). Almost identical result here, despite the energy-efficient hardware – 225 minutes (3 hours and 45 minutes). 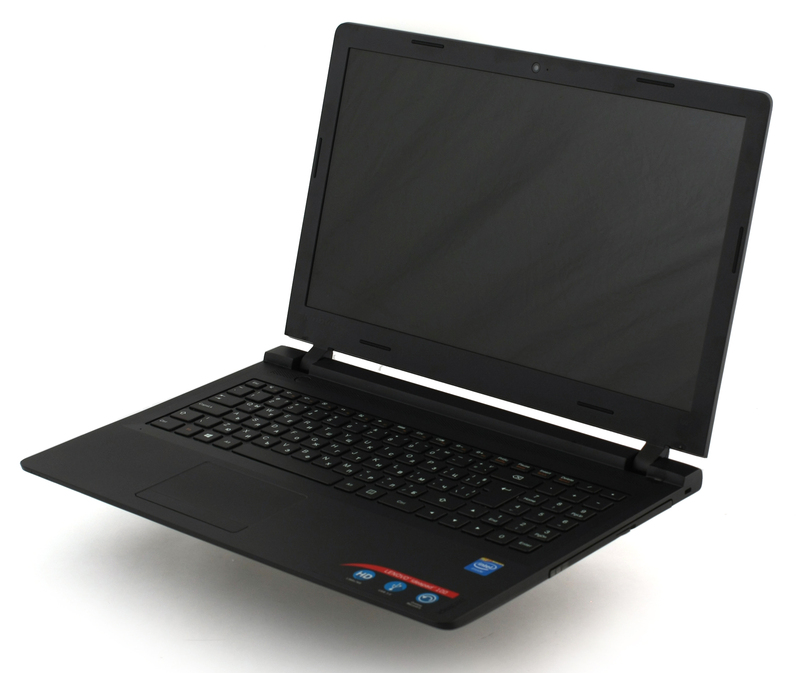 Entry-level CPU aimed to be used in small ultrabooks and notebooks excelling in power efficiency. The chip is clocked at 2.58 GHz with two cores and it’s part of the Bay Trail-M platform. However, useful features like Intel Quick Sync and Wireless Display are supported. Here you can see an approximate comparison between the CPUs that can be found in the Lenovo ideapad 100 (15") models on the market. This way you can decide for yourself which Lenovo ideapad 100 (15") model is the best bang for your buck. The performance of the Bay Trail graphics is sufficient for a 2560×1600 resolution, allowing for gameplay of some older titles or just less graphically intense titles like FIFA 13. Here you can see an approximate comparison between the GPUs that can be found in the Lenovo ideapad 100 (15") models on the market. 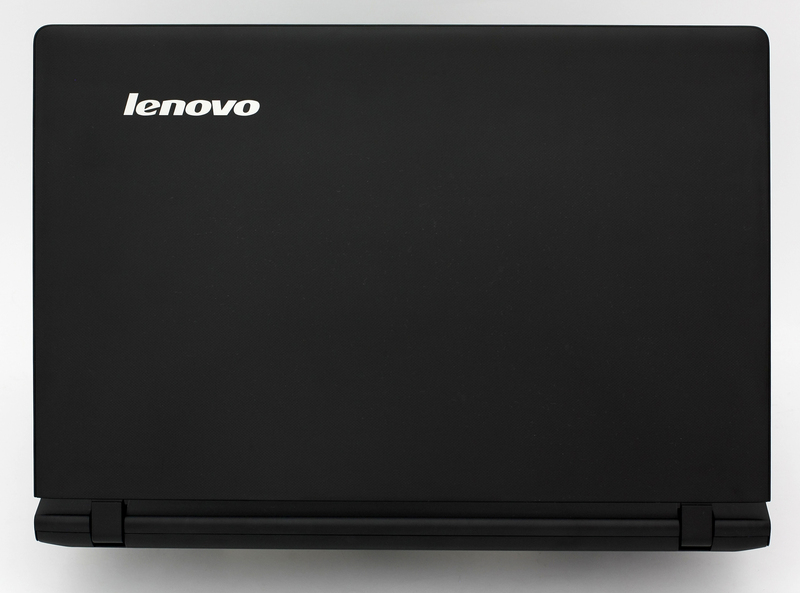 This way you can decide for yourself which Lenovo ideapad 100 (15") model is the best bang for your buck. A rather important aspect of buying a new notebook is how the system handles higher temperatures due to the bigger load. We test each machine we review with continues torture tests of the CPU and GPU and this way we assess the overall stability of the laptop in the long run. However, 100% CPU and 100% GPU load is virtually impossible to be reproduced during normal usage. We start off with the CPU stress test for about an hour. From the image below you can see that the chip runs at 48 °C under normal usage and can go up to 66 °C when the load is 100%. We didn’t observe any throttling and the CPU was ticking at 2.57 GHz throughout the whole stress test which is rather impressive given the fact that this is a fanless notebook. But how much heat can a 7.5W CPU produce, anyway? The green line on the graph below represents the CPU load while the red one stands for the temperature. After an hour has passed, we ran the GPU stress test alongside the CPU torture test. 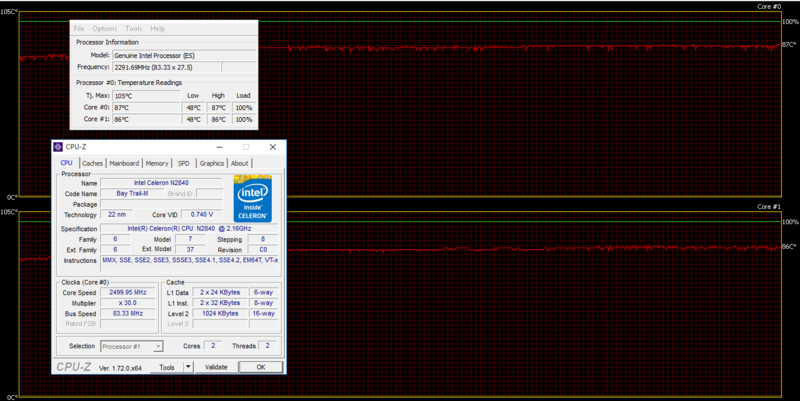 The CPU’s frequency dropped a bit to 2.5 GHz, which can be considered as a minor throttling, but the temperatures rose up to 87 °C, yet far away from the Tj. Max of 105 °C. Results are good given the fanless design. After almost two hours of testing, we’ve measured the temperatures of the outer chassis to see whether or not the inner temperatures affect user’s experience. And what we feared the most about the cooling system and overall construction proved to be true. 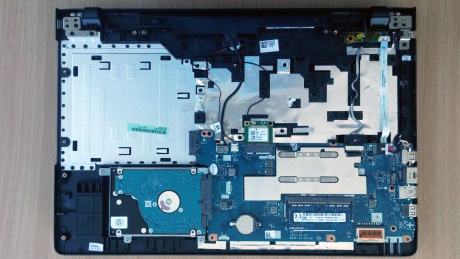 Since the motherboard is located right beneath the touchpad and the area where palms rest, the user may feel some excessive heat during prolonged hours of work. The touchpad and the area around it were unpleasant to touch due to the high temperatures. At least reaching those high inner temperatures isn’t easy, but the results on the heat map below should be taken into account when buying the laptop as it may be a deal-breaker for some users. 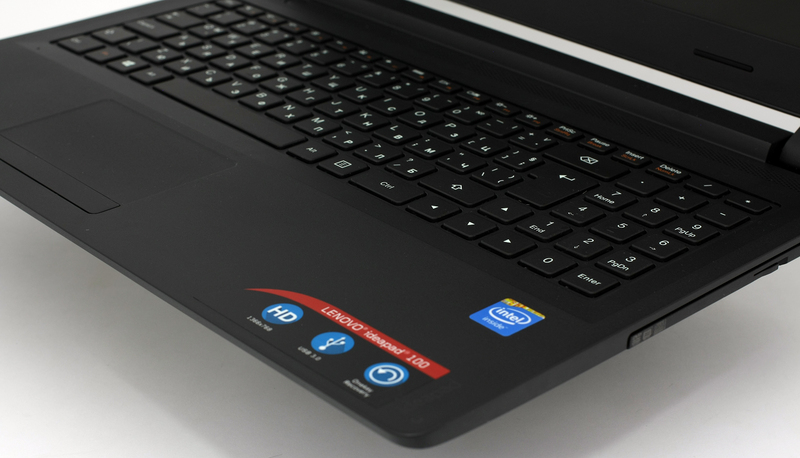 The Ideapad 100 seems to be the perfect choice for users that will use the notebook mainly for day-to-day related tasks like writing, browsing and light applications. You can’t expect much from the hardware as the CPU, RAM and display are budget-oriented pieces of hardware as you’ve already guessed from the price. The screen carries its useful and not so pleasant properties inherited from the TN panel used inside. Furthermore, the use of PWM is also present across all brightness levels, but at least the frequency of the emitted light is relatively high resulting in less damage to human vision. This is by far the best rewiev of this laptoop. BTW I am getting tired of people ranting about the battery life most people connect their charger when they’re using it. I have that PC and actually the Pentium is better. Where do you insert a simcard into this notebook?